an invitation to see if there are any updates. On the bus or MTR we play games and listen to music, earphones in. At lunch we make sure to have it with us. Waiting anywhere is a chance to engage with anything on the phone. We have a habitual relationship with technology. 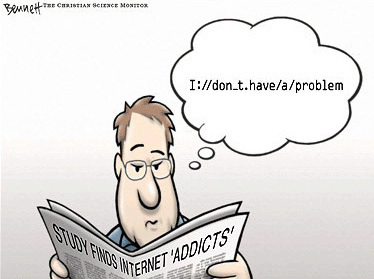 Many of us may not feel we have a web addiction, but in truth, most of us have some level of dependency. And we’re not alone. In China, there are currently 400 intensive treatment centres for web addiction. How does my relationship to technology distract me? What information do I consciously take in that helps my well-being? Am I using technology as a tool for distraction and avoidance? Does my relationship with my screen keep me away from my real-life relationships with myself and my family? Technology is a tool, so it’s up to us how we use it. It’s a tool for children, too – an educational tool. Yet teenagers in some parts of the world spend an average of six to eight hours in front of a screen outside school hours, doing homework while chatting and messaging with their friends, watching video clips and surfing the web. Are we as parents fostering a generation of internet addicts? staying online much longer than originally intended? showing aggression when online time gets interrupted? increasingly giving up time with “real life” friends? unable to sleep, or more than usually irritable, moody or lethargic? Two game nights per week. Break out the cards and board games! Go hiking as a family on the weekend. There are trails for every level. Movie night. Watch something old or new together, and don’t forget the popcorn. Read and talk about topics of interest to you and your kids. This can range from discussing the latest YouTube heroes to what’s happening in world news. Read the same books as your older kids. Discuss. Keep on top of new releases, and plough through trilogies and sequels together. Get outside and get active. Go out and kick the ball around. Play catch. Play tag. Be mindfully present for them so they can talk to you when they need you. Technology does not need to be eradicated from our lives. But we must make thoughtful choices about how and why we use it and when we should put it away.